I had my first swim with manatees many years ago at Merritt Island, Florida. As I was standing in the shallow water of the Indian River Lagoon scrubbing algae off the bottom of my boat, something huge and wet suddenly nudged me gently but firmly in the small of my back. I quickly turned around to look into the little button eyes of a manatee. He (or she) was about 10 feet long. When my heart stopped pounding, I had fun stroking and petting him and giving him some water from the dock hose. My new friend and I slowly swam together around the marina. It was the first swim with manatees event at Jay's Harbor Lights Marina. A swim with manatees these days is a whole lot more organized than was my spontaneous experience, especially at some of the Crystal River Florida tourist attractions. Now you can go to Crystal River, 70 miles north of Tampa, and find numerous places that will take you to where the West Indian Manatees are. Manatees are also known as sea cows. They can get to be 12 or 13 feet long and weigh 3000 pounds. These gentle mammals graze slowly in shallow waters munching sea grass like an aquatic cow. They also like to take naps down on the bottom. They are usually very trusting, calm and curious. When you swim with manatees, you will be amazed at how safe they feel with you. 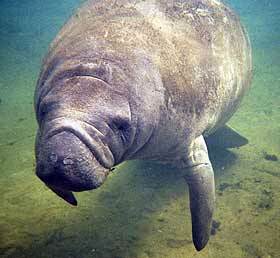 Sad to say, but early Florida crackers and Caribbean natives took advantage of the manatee's trusting nature. They routinely killed these gentle creatures and got enough meat to live on for many months. These days they are protected, but are still endangered by boats. They get killed or injured by boats crushing them between their hull and the bottom of the water body. The also get slashed badly by boat propellers. 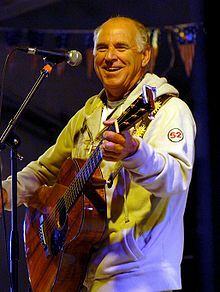 Organizations like the Save The Manatee Club and individuals like singer/writer Jimmy Buffet are devoted to protecting the manatee. Their only other big enemy is cold water. Manatees cannot survive in water below 60 degrees, so every winter in Florida they flock to where the warm water is. This is why cooling water discharges at power plants and natural spring fed rivers are always good manatee watching areas and informal Florida tourist attractions. From November through March, Crystal River is the best place to swim with manatees or to watch them in Kings Bay. The headwaters of Crystal River, Kings Bay is fed by a number of fresh water springs that produce 600 million gallons daily at a consistent 72 degrees F year round. Some people estimate that as many as 400 manatees take their winter vacation in the waters of Kings Bay. 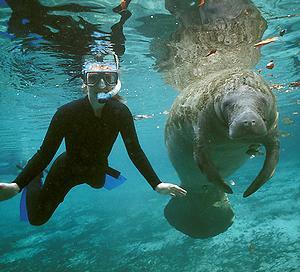 There are many businesses in Crystal River that will take you snorkeling among the manatees. If you are lucky, you will see a baby manatee. They are so cute you will want to take one home with you. When you rub their belly they make little tiny chirping sounds like a baby chick. You will definitely see the large adult manatees. They will be very nonchalant around you. Neither you or the manatee will feel threatened. The town of Crystal River is home to about 3,600 people. It has all the lodging and restaurants you would expect of a town whose main industry is manatee based tourism. 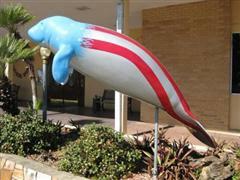 You have to love a town where City Hall is decorated with a red, white and blue manatee statue. There are many businesses in Crystal River that offer swim packages. There are also kayak and canoe outfits that run manatee-sighting trips on the Crystal River and Kings Bay. Some of these outfits also run trips on the nearby Homosassa and Chassahowitzka Rivers. The American Pro Diving Center, 821 Southeast Highway 19; 352-563-0041; opens at 7 a.m. for the first Crystal River swim with manatees expedition of the day. The fee for the tour, including wet suite and snorkel gear is $69.50; the trip lasts three to four hours. Crystal River Kayak Company, 1326 Southeast Highway 19; 352-795-2255; offers guided kayak and canoe tours of area bays and rivers, including a sunset paddle and a birding trip. Guided tours start at $50; kayak rentals start at $20 for three hours. Homosassa Springs Wildlife State Park, 4150 South Suncoast Boulevard, Homosassa Springs; 352-628-5343; is open every day from 9 a.m. to 5:30 p.m; the ticket counter closes at 4 p.m., and the last boat ride to the park departs at 3 p.m. Tickets are $13 and $5 for ages 6 to 12. From Tampa, take SR-589 (Suncoast Parkway) north to US-98 north of Brooksville. Then continue north to US-19 and go about 20 miles to Crystal River.